Food Service Management is the management of all establishments where food is served and extending hospitality to customers. Dietetics is the science and art of human nutritional care during health and diseases. Knowledge dissemination, professional competency and nurturing traditional food culture practices. 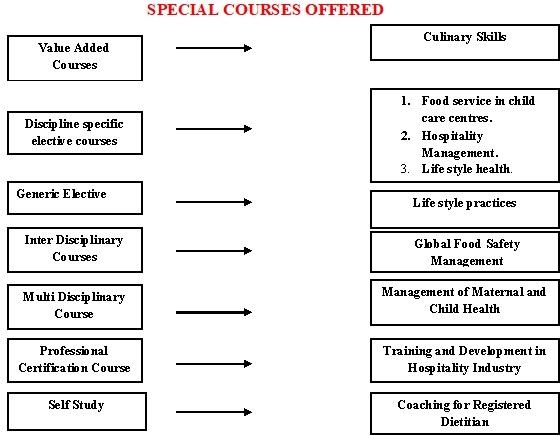 Competency to be employable in hospitality and service industry. Indian Dietetic Association �Coimbatore Chapter was incepted in the year 1978 by the dion of Nutrition Padmashri Dr. Rajammal P. Devadass. This vibrant chapter serve as a knowledge sharing platform to connect professional across the nation. 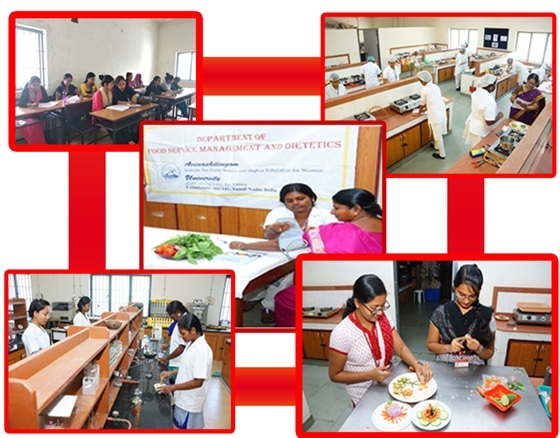 With a total of 763 Life Members comprising practicing dietitians, academician, free lancer and students, the chapter organizes meetings, workshop, training programmes and scientific conference / seminars periodic interval. It also conducts awareness programmes to promote healthy eating habits to foster a healthy society. The department of Food Service Management and Dietetics offers diet counseling to the students and staffs of the university and general public on request. The department has completed six major research pr ojects funded by UGC, DST, ICMR, Heinz Canada and has one ongoing project. The department has completed eight minor research projects and has two ongoing projects. 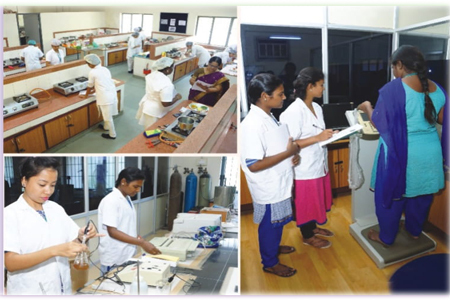 Imparts knowledge and skill through innovative teaching learning programmes and research. 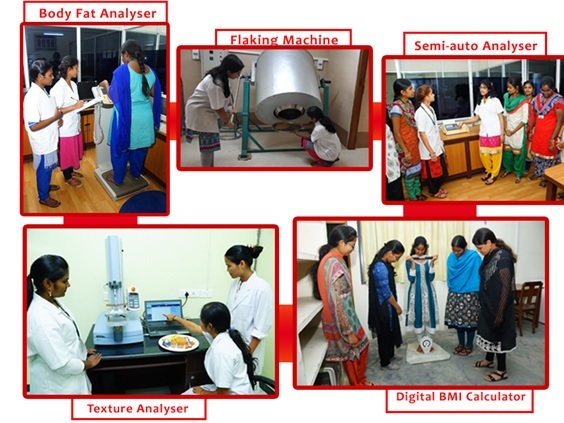 Undertakes need based researches in the field of therapeutic nutrition, nutraceuticals , food preservation and processing, value addition and management of food service. Disseminates research findings to the community at grass root level. Training agriculturists of on fruit and vegetables processing technique. Counselling the community on good health and Gandhian diet. Nutrition education programme for Irula tribes at Neelampathy. Therapeutic nutrition counselling for the public and differently abled children. Capacity building of women entrepreneur in food processing with special reference to Tomato , Amla and Guava. Orientation and training programme for anganwadi workers on healthy living. Nutrition education through community nutrition camp. Anaemia: Dietary interventions were given to 13,500 women and adolescent girls from various parts of the state through supplementary and value added products. Osteoporosis: Screening was done and dietary guidelines were given for 1,200 women by conducting bone density tests. Obesity: Identification and management of obesity was carried out among 16,800 school children and young adults. ICT enabled nutrition education and individual diet counseling was given. Cardiovascular: Assessment of risk for cardiovascular diseases for 3,000 women and 1,500 men was studied through Cardiovascular Risk Index developed by the department. Diabetes: Therapeutic management of diabetes mellitus was done for 17,000 newly detected and known diabetic population in and around Coimbatore district. Identification of pre-diabetes among college students and young adults was also done. Renal diseases: Dietary management for renal diseases was done for 3000 patients with Acute and Chronic Renal Failure. Cancer: Cancer screening and nutrition education for cancer patients was carried out for 3,750 cancer patients. Fruit and vegetable carving by Mr. S.IIlayaraja Chef Sterling Resorts. Coimbatore. Two days hands on training programme on SPSS package for I and II PG students. Avinashilingam University , 18 th - 22nd February 2013. Dr. Vijayalalithambigai, District officer and Designated officer of FSSAI, Coimbatore on ‘Food Safety for Green Consumerism’ and Dr. R. Narasimman, Food Safety Officer, Coimbatore on ’Know what you eat to ensure Food Safety’ in connection with World Food Day Celebration. Dr. Muthu G Periasamy ,Professor, Cardiovascular Metabolism Program, Center for Metabolic Origin of Disease, Sanford Burnham Prebys Medical Discovery Institute, Florida, USA - "Preventing Obesity and Diabetes - Global Epidemic"
Tokushima, Japan. Topic - Statistics to Process Data in Nutrition Epidemiology. Ms. Lalitha Ramamoorthy Consulting Dietitian for Infinity Primary Care,Novi Michigan, USA. Topic - Chronic Kidney Disease and Diet Assessment, Management and Treatment. Dr.Krishna Srinath,ICAR Emeritus Scientist, TANUVAS, Chennai &Former Director Directorate of Research on Women in Agriculture, Bhubaneswar. Topic - Role of Women in Ensuring Sustainable Food and Nutrition Security.